The gray Cape Cod house at 9 Quentin Road was home to two renowned artists - Austin Briggs and Ed Vebell, the latter of whom raised his family there and lived there until his passing a year ago. WESTPORT — A handful of houses still exist in the Westport landscape that are tied to the town’s early history. 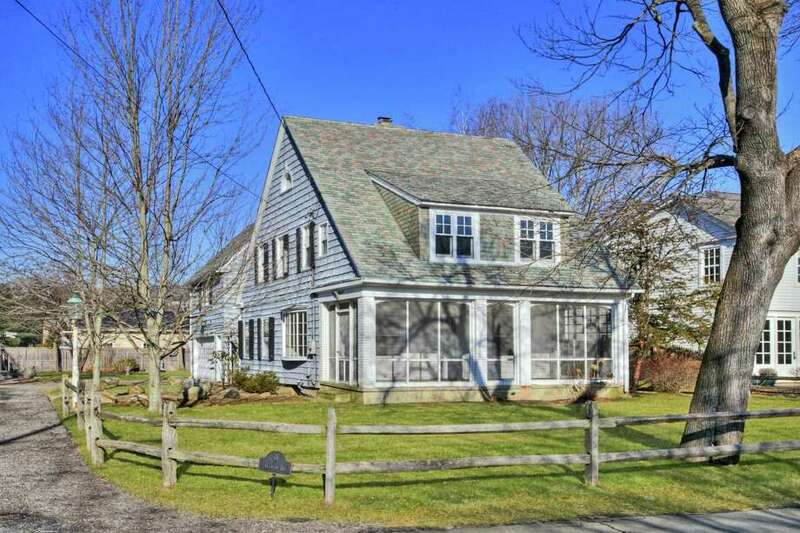 The gray, Cape Cod-style house at 9 Quentin Road was built in the 20th century, so its occupants were not witness to the British troops that came ashore near what is now Compo Beach and spilled the blood of patriots defending their newly formed country during the Battle of Compo Hill in 1777. This house is tied, instead, to a different facet of Westport history, one that involved preeminent artists. Not one, but two celebrated artists once called this place home. The eight-room house in the Compo Beach neighborhood was built in 1926 and was owned in its earlier years by illustrator Austin Briggs, who created artwork for The Saturday Evening Post, Redbook and Cosmopolitan. He also drew the popular comic strip Flash Gordon. In 1953, legendary illustrator and photographer Ed Vebell purchased this house for $29,000 from Briggs. Vebell was a bit of a renaissance man: renowned artist, illustrator, photographer, Olympian, author and collector of military paraphernalia. In addition to the numerous magazines that published his artwork — including Time, Life and Sports Illustrated — Vebell was drafted into the U.S. Army in 1942 and worked for Stars and Stripes magazine for which he covered the Nuremberg trials illustrating the courtroom proceedings. Vebell bought this house “sight unseen,” according to his daughter Andra Vebell. It was an auspicious move because of the northern light that spilled into Vebell’s spacious art studio above the attached two-car garage. “North light is a unique thing to have because north light does not create shadows or highlights on your work. North light was always desirable,” Andra Vebell said. “Often my sisters and I would wander upstairs to the studio to hang out. ... My oldest sister became an illustrator and learned a lot just looking over his shoulder,” she said. That north light, and the creative energy that probably still swirls throughout the 1,971-square-footage of living space might be attractive to another artist, or perhaps a writer. But this is the perfect home for anyone who enjoys living in a waterfront community. This house is only one block from Compo Beach and Ned Dimes Marina. It is also within easy walking distance of Longshore Club Park and all the recreational and social amenities there. “Westport is a special town and the beach is a very special part of Westport. It was a dream to grow up down here; to be able to just walk out your door and run down to the beach, to have that as your playground, literally and figuratively, makes growing up fantastic,” said Andra Vebell, who still lives in the neighborhood. One of the things she appreciates about the location of this house is its proximity to the water without being in the thick of summer throngs. Its residents enjoy a larger measure of privacy than those a bit closer to the beach. It is also a walking neighborhood where fellow residents get to interact. “It’s a real community,” she said. Of the house, Andra Vebell said it was built very strongly, constructed with brass nails and extra thick plaster, as her husband, Larry Hoy, found out when he did some work on it. Hoy is an artist and designer of churches. The shakes on the exterior are elongated and staggered a bit creating a visually appealing facade. The house sits behind a split rail fence on a 0.3-acre level property. Its private crushed stone driveway provides ample parking for guests. The facade features black slivered moon shutters and white trim, and a slate roof. At the front is a large screened porch with a slate floor. The living room features a fireplace with a surround comprising hand-painted imported tiles and a bow window from which to catch the sunsets over Grey’s Creek a block away. Gaze down Roosevelt Road to the boat basin at Compo Beach. In the dining room there are built-in shelves and cabinets. The eat-in kitchen features a center island topped with granite, another granite counter, glass-front cabinetry, and a Sub-Zero refrigerator. On the second floor there are four bedrooms. Ed Vebell’s art studio features a brick fireplace, exposed beams, a wall of floor-to-ceiling bookshelves, and a full bath. For more information or to make an appointment to see the house contact Helen Cusa of Halstead Real Estate at 203-451-7731 or hcusa@halstead.com.